Warning: Spoilers follow for The Witch. 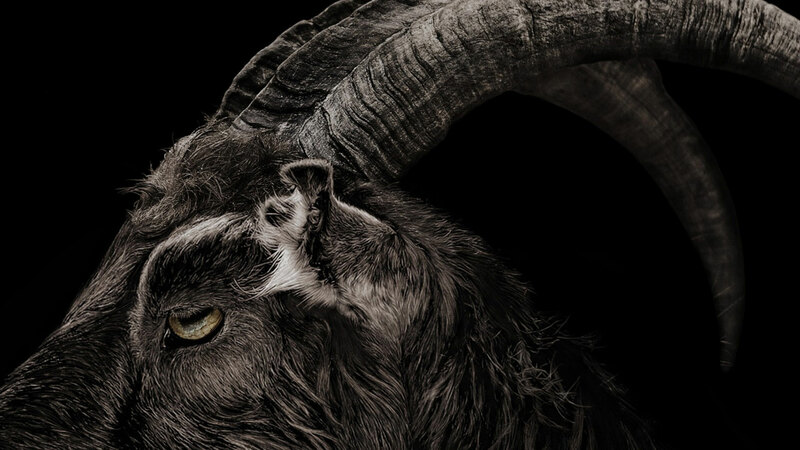 Robert Eggers’s directorial debut, The Witch (2015), is, to use his own words, a puritanical nightmare. While it can be seen as the collapse of a New England family in the 1630s who brave the wilderness, I would like to argue that it can also be a coming of age tale, and more importantly, in such an opaque protagonist as Thomasin (Anya Taylor-Joy), the state of her hair is more than just a matter of coincidence or aesthetic choice, but rather a deliberate theatrical choice to give some illumination as to her current state of mind. Hair has always held a point of power and fascination for humankind. From ancient Greek myth, to paganism, to Christian Biblical times, to ancient Egyptian history, to simple human interest, hair has captured humankind. Long hair was a symbol of wealth in ancient times, and slaves were forced to shave their heads. Lovers frequently committed the intimate act of exchanging locks of hair, almost as if a piece of their lover’s essence would be captured in the lock itself. Perhaps more important to our subject matter: during the Spanish Inquisition, capturers of so-called witches always shaved the witch’s hair first before imprisoning her. Film is no stranger to the power of hair. It has become a common trope for characters, especially female characters, to undergo a dramatic change of hairstyle to signify a drastic internal change. Think of Amy Dunne (Rosamund Pike) in Gone Girl (2014), who cuts and colours her hair in a gas station bathroom after she leaves her house. Think of Mulan (1998), where Mulan cuts her hair the night before she will enlist in the military. This is not limited to only female characters however, in Full Metal Jacket (1987), we see every new soldier getting a severe buzzcut, symbolically severing his ties to his former life and self. And in The Royal Tenebaums (2001), Richie Tenebaum (Luke Wilson) shaves his hair and beard before he attempts suicide. In conclusion: there is power in hair, as 2007 Britney Spears can readily attest to. Hair is also a very important and deliberate factor in The Witch, however to understand how powerful it is, we need to first understand the context. The film takes place in New England in the 1630s. This was well before the chaotic Salem witch trials, with the first generation of British Settlers. The settlers were famously religious; superstition ran high and most acts woman committed were viewed with suspicion. Women were expected to fulfil the matriarchal role in society, without having an actual political or economic hand in their society. Women were also expected to dress accordingly. Among other things there were societal rules as to their hair. It had to be put up, and covered with a bonnet, even while sleeping. This only affirms the superstitious power of hair. Long, loose and uncovered hair was associated with raw sexuality. It was considered indecent and a woman who wore her hair in this manner would be considered, insane, possessed, or in league with the Devil by being a witch. This is why I consider the style of Thomasin’s hair to be a direct indicator to her gradual loss of faith in her religion, society and the general patriarchy. This is a young woman, who’s heard since her birth in which state her hair should be. Thus, when her hair is in disarray, it’s more than a girl being too preoccupied to put her hair back up, it’s an unconscious defiance. When we first meet our protagonist, Thomasin, she and her family are on trial. We can tell that her family has committed an act that goes against the general belief of their community. We can tell her father is a religious extremist because he believes the act to be in accordance to his personal beliefs and continues to judge the counsel and other members of the community for not being religious enough. Thomasin is an opaque character. It is close to impossible to read on her face exactly what she is thinking. Although you can pick up on a sense of reluctance when they are forced to leave the community. In their first few days in their new home far away from the settlement we see Thomasin doing what she needs to do. Doing her chores, praying and obeying her parents. Thomasin (Anna Taylor-Joy) in The Witch (2015), directed by Robert Eggers. Here we can see Thomasin in the beginning of the movie praying. She is dressed exactly as what is expected of her, and even though we can sense that there is a sense of doubt in her character, we have no outer evidence of this yet. However, as the movie progresses, it is interesting to note that Thomasin’s hair becomes gradually more disarrayed. We see wisps of hair escaping from under her bonnet, as we can see her struggle more heavily with her family struggles, especially with her mother. Thomasin and sister Mercy (Ellie Grainger) in The Witch. The first signs of disarray can be noted, after Thomasin tells her younger sister, Mercy (Ellie Grainger) that she is a witch and threatens her. More wisps of hair escapes after Thomasin’s accident in the woods. The fact that this happens in the woods is also significant due to the symbolism of woods which has long been associated with witchcraft, and feminine mysticism. While the family is caring for and praying for Caleb (Harvey Scrimshaw), we see Thomasin’s hair more disarrayed as she continues to become more sceptic of their beliefs and rules. After their father shut them up for the evening with the goats, Thomasin’s hair has reached an interesting new state, being uncovered. This could suggest that this trauma has caused her to internally broken herself off from the societal rules she’s been adhering to all her life. When confronting her mother, we see that Thomasin’s braids has come undone, which could suggest a break with her familial structure. After her confrontation with her mother, Katherine (Kate Dickie), even her braids have become undone. After this encounter, Thomasin not only undoes her hair, but also takes off her shift. It becomes clear that she’s officially broken with all patriarchal values. The final stage. By now, Thomasin is completely naked. She is no more bound in physical appearance, or emotional sentiment to what was. In this state, she will seek a new life that she agrees with, instead of enduring a life she has been born into. Hair is also an important analysing tool when it comes to analysing the other female characters, specifically Katherine (Kate Dickie). In other female characters, their hair is only ever loose and/or uncovered if they are revealing their true desires. 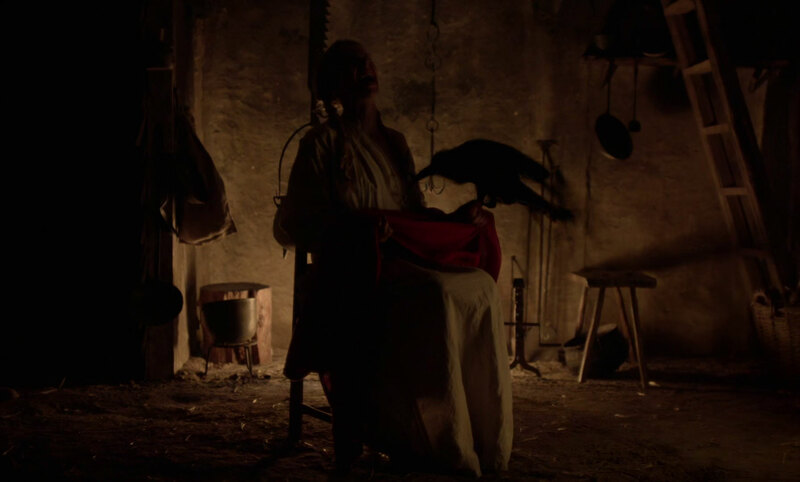 This can be seen in every seen where the witch appears, as witches inherently follow their own desires, but we also see this with Katherine, Thomasin’s mother. She has her hair uncovered in two instances. The first when her two dead sons come back to her, which reveals her hidden desires to have her sons back, even though this desire is against their beliefs. Katherine (Kate Dickie) in The Witch. The second is when she honestly confronts Thomasin. In this confrontation, she finally unleashes all her harsh doubts and scepticism surrounding Thomasin. By taking off her bonnet, Katherine somehow regained her individuality and finally has the courage to honestly share her feelings. Small details can speak volumes when it comes to film. By using a subtle element such as a character’s state of hair, Eggers manages to further themes of religious doubt, familial trauma, and patriarchal oppression. It also allows us access to Thomasin’s inner state of mind. This way we can follow her journey from the moment she kneels down to pray up until we share her ecstasy the moment she is lifted up high above the forest tree tops.